Matthew Foster: CrossFit Level-1 Coach. Matthew grew up in Mesa, and loves living in Arizona. Matthew went to Arizona State University and graduated with a bachelors of engineering in Computer Systems Engineering. He is married and has 4 children. Growing up Matthew enjoyed running and playing recreational sports, but most of his life had struggled with his weight. After graduating from college he settled down into a software engineering job at Intel Corporation. As you can imagine sitting down at a desk for hours straight programming wasn’t very conducive to keeping up a fit lifestyle. During this time Matthew had tried to keep a consistent fitness regimen at the local big box gym with little success at keeping his weight down. In October of 2012 Matthew had reached the heaviest weight he had ever been in his life, with a BMI that classified him as morbidly obese. The physical condition he was in was affecting everything from spending quality time with his family to making it difficult to just tie his shoes in the morning. He decided then it was time make a drastic change. He found The Cell’s Facebook page and was instantly intrigued at the kind of workouts he saw. 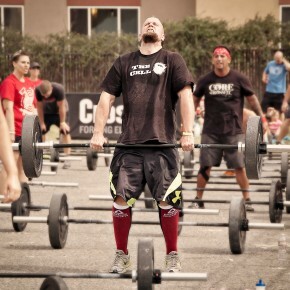 He contacted Ammon and joined The Cell and did his first CrossFit workout late in October 2012. He was instantly hooked and has since never looked back. He has not missed a week of CrossFit since then, has lost 125 lbs and went on to be a CrossFit Level-1 Trainer. His motivation as a coach is to share his life changing experience with others and express his passion for fitness by helping others reach their fitness potential as well.